Pulmonary arterio venous malformations are one of the rare vascular anomalies. Usually single large pulmonary arteriovenous fistula (PAVF) can be closed through transcatheter route but multiple PAVF require surgical lobectomy. 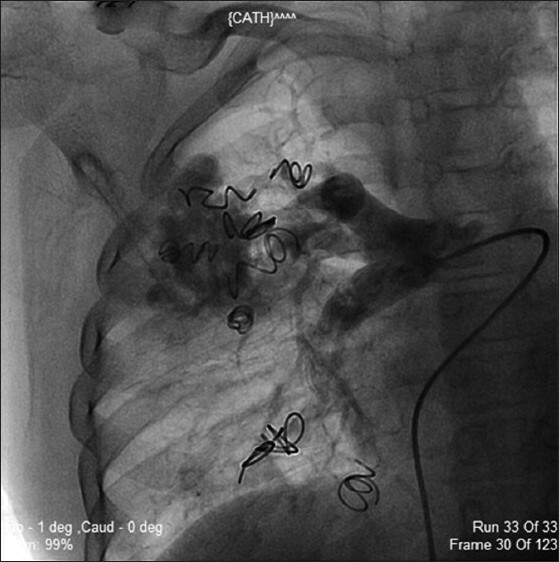 We describe a case of an 8-year-old boy with multiple PAVF, who underwent successful transcatheter closure with multiple coils. 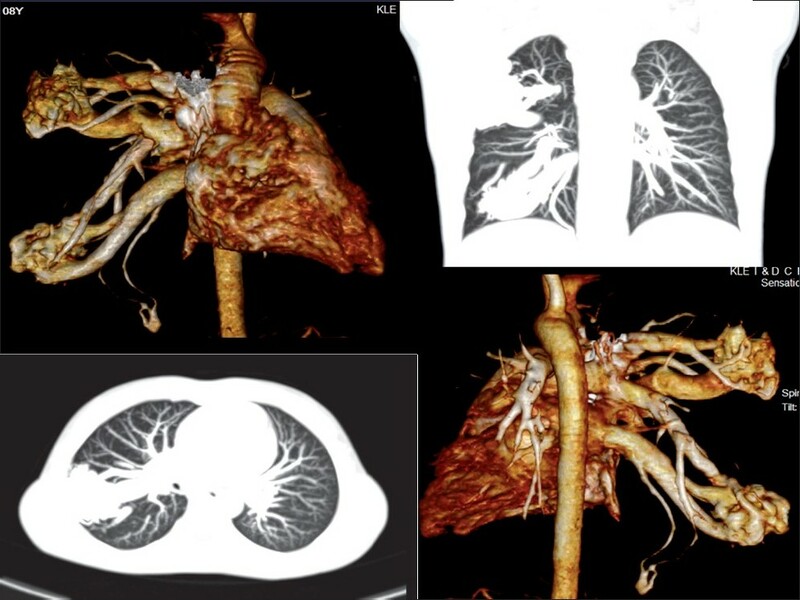 Pulmonary arterio venous malformations is one of the rare vascular anomalies comprising direct communication between the branches of pulmonary artery and pulmonary vein, without intervening pulmonary capillary bed. It was first described by Churton in 1897. Clinical presentation ranges from incidental finding on chest X-ray to cyanosis, heart failure, or neurological deficit. High incidence of neurological complications in the form of cerebral embolism or abscess mandates aggressive therapy whenever possible. An 8-year-old boy presented with NYHA class II breathlessness since 5 years. He was evaluated at the other institute and all intra cardiac anomalies were ruled out. Patient had central cyanosis and grade III clubbing. There were no telangectasia of skin or mucous membrane. Physical examination was unremarkable with normal heart sounds and no murmurs. His oxygen saturation, as recorded on the pulse oxymeter, was 87% while breathing room air. Hemogram revealed hemoglobin of 19.3 mg/dl and packed cell volume (PCV) of 68%. His electrocardiogram was normal. Contrast echocardiogram showed appearance of contrast in the in the left atrium after three to four cycles following the opacification of the right-sided chambers, suggesting the presence of pulmonary arteriovenous fistula (PAVF). Computed tomographic pulmonary angiogram revealed multiple PAVF in the right lung [Figure 1]. The right femoral artery and vein were cannulated using 6F and 7F sheaths, respectively. 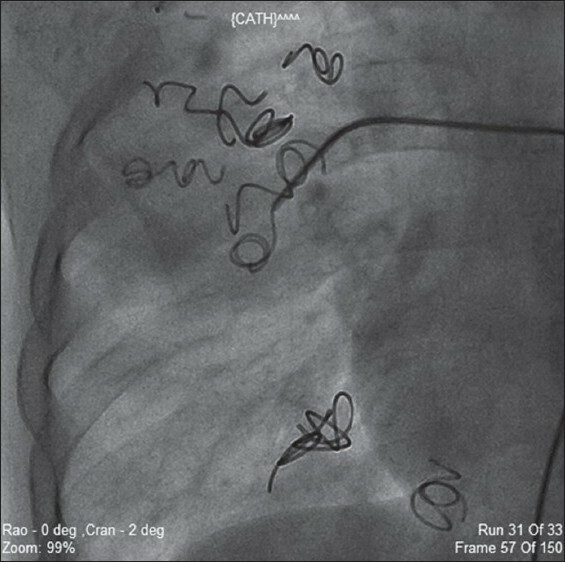 Pulmonary angiogram, done using a 7F balloon tipped angiographic catheter, revealed a large PAVF in right lower lobe and another three smaller sized PAVF in upper lobe of right lung [Figure 2]. Using 6F internal mammary artery catheter, right lower lobe pulmonary artery was negotiated and a guide wire (0.035 Χ 260 cm, Terumo, Japan) was passed across the fistula. Then, 90-cm long 7F coil delivery system was positioned on the same wire. Check angiogram revealed the largest diameter of fistula to be 12 mm. A 15 mm Χ 8 cm coil (0.052", Cook Inc., Bloomington, IN, USA), which was 3 mm larger than the fistula diameter, was selected. With the help of introducer and delivery system, the coil was deployed into the fistula in a stable position. Since this did not occlude pulmonary AV fistula completely, another 8 mm Χ 8 cm coil was deployed close to the initial coil [Figure 3]. The check angiogram revealed tiny residual flow. The other fistulae, one in the right lower lobe and three in the right upper lobe, were subsequently occluded in a similar manner using 8 mm Χ 8 cm, 5 mm Χ 5 cm, 5 mm Χ 6 cm, 8 mm Χ 5 cm (Cook Inc.) coils, respectively. The check angiogram revealed near complete occlusion of all the fistulae. The patient remained stable post procedure with an oxygen saturation of 97% while breathing room air, and was discharged. At 6-month follow up, a repeat pulmonary angiogram was done. It showed partial recanalization of the upper lobe fistula while the lower lobe fistulae continued to show complete occlusion. Room air oxygen saturation was 87%, but the patient continued to remain symptom free [Figure 4]. The morbidity associated with pulmonary arterio venous malformations is up to 50% in untreated patients as compared to 3% in those who receive treatment. The goals of treatment are threefold: 1) improvement of dyspnea/hypoxemia 2) prevention of lung hemorrhage and 3) prevention of neurological sequel. Between 1942 and 1977, surgery was the only method of treatment for PAVF. Ligation, local excision, segmentectomy, lobectomy or pneumonectomy was performed in most cases. For multiple pulmonary AV fistulae, lobectomy was the method of choice until recently. However, lobectomy has long-term problems in the form of development of pulmonary hypertension. In a 15-year prospective study, extensive lobectomy was shown to result in the early development of pulmonary hypertension in as high as 30% patients. As our patient was a young child, we decided to avoid extensive right lung lobectomy to prevent the development of pulmonary hypertension in future. Recent advances in hardware have made transcatheter closure of these multiple PAVF feasible. Our case is an unique example of closure of multiple PAVF by transcatheter route. Though the procedure is time consuming and cumbersome, it has multiple advantages since there is no need for general anesthesia or thoracotomy. There is less pain, early recovery and absence of a scar. Also, there is no loss of normal lung tissue, which is likely to happen with a lobectomy or pneumonectomy. 1. Saxena S, Gothi D, Joshi JM. Pulmonary Arterio-Venous malformation treated with embolotherapy. JAPI 2003;51:398-400. 2. Yuksel M, Ozyurtkan M, Topaloπlu N, Laηin T. Pulmonary arterivenous malformation treated by lobectomy. Marmara Med J 2005;18:87-9. 3. Liptay MJ, Vjiki MB. Congenital vascular lesions of the lungs. In: Shields TW, Editor. General Thoracic Surgery, 6 th ed. Philadelphia: Lippincott Williams and Wilkins; 2005. p. 1142-56. 4. Puskas JD, Allen MS, Moncure AC. Pulmonary arterio-venous malformation: Therapeutic options. Ann Torac Surg 1993;56:253-7. 5. Sreedharan M, Baruah B, Dash PK. Transcatheter occlusion of a large pulmonary arteriovenous malformation. Indian Heart J 2004;56:343-5. 6. Sagara K, Miyazono N, Inoue H, Ueno K, Nishida H. Recanalization after coil embolotherapy of pulmonary arteriovenous malformations: Study of long-term outcome and mechanism for recanalization. Am J Roentgenol 1998;170:727-30. 7. 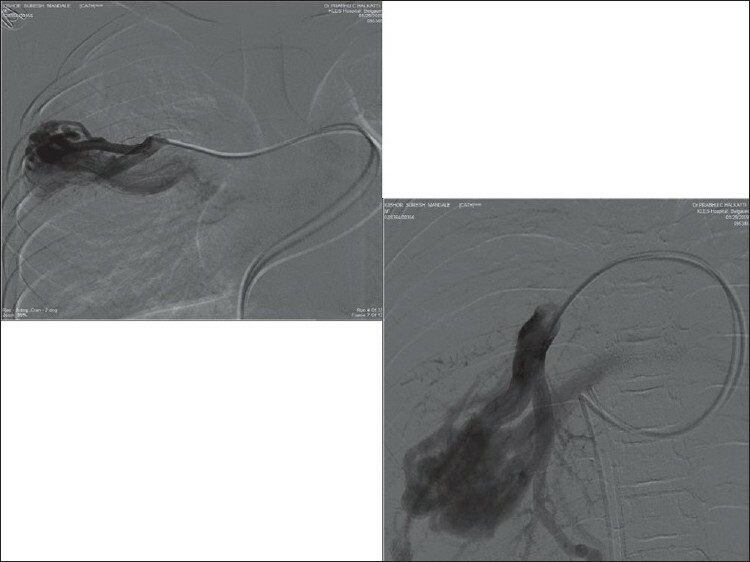 Ferro C, Rossi UG, Bovio G, Seitun S, Rossi GA. Percutaneous transcatheter embolization of a large pulmonary arteriovenous fistula with an Amplatzer vascular plug. Cardiovasc Intervent Radiol 2007;30:328-31. 8. Ueki J, Hughes JM, Peters AM. Pulmonary arteriovenous fistulas: Mayo Clinic experience, 1982-1997. Mayo Clin Proc 1999;74:671-80. Goswami, D., Das, S., Parida, A., Sanyal, J.